Two excavators are being used to clear the 4.7 mile (7.5km) track. 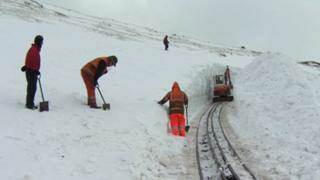 It is unlikely passengers will be able to travel to the summit over Easter but it is hoped the train will be running to stops three quarters of the way up. He said around 12 people were attempting to clear the snow.